Stenches: A Zombie Tale of Trenches is, as the name so obviously indicates, a zombified take on the popular Trenches game by Thunder Game Works. That means that, yes, it’s yet another tower defense game on the iPhone. 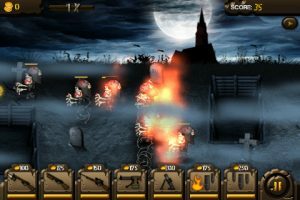 It also means that, yes, it’s yet another zombie-themed game for iPhone. 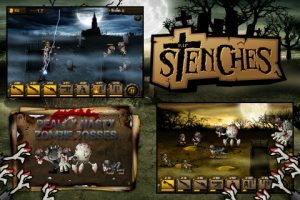 Luckily for the good folks at Thunder Game Works, Stenches offers enough charm and addicting gameplay to stand out from the countless other defend-the-base-from-the-attacking-force-which-may-or-may-not (but probably does) contain-the-undead games. 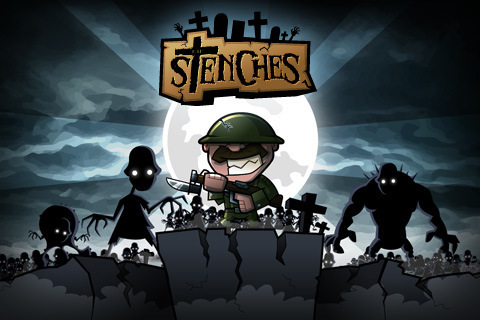 Stenches takes place in the European Theater of World War II, and as a British Commander you have to protect your bunker from a zombie attack. But don’t let that fool you into thinking you’re in for a serious strategy game. The name “Stenches” indicates right off the bat that this game isn’t about to take itself too seriously. The humor permeates every aspect of the game, from the goofy sound effects to the wonderful cartoonish appearance. The basic gameplay is rather standard for the genre. The zombie’s attack from the right and troops are sent out from the left by moving and positioning them using your finger to slide across the screen. And because the battlefield is rather large, you’ll be constantly scrolling back and forth to keep an eye on your troops and to collect coins. These coins are your currency, with which you will purchase additional troops, artillery, and air strikes. As the game progresses, the zombie attacks become faster and more furious. In addition, you’ll have to protect your troops from random lighting bolts, lest they be zapped into oblivion. Stenches contains two separate game modes: Waves and Distance, both of which are rather self-explanatory. In Waves you’ll progress through levels that gradually become more and more difficult as the zombies increase in size, speed, and ability. In Distance, you’ll need to advance your troops as far as you can, going for the furthest distance, which you can then compare against your friends. Frankly, up to this point Stenches is a good, but fairly run-of-the-mill tower defense title. But there are a few factors that help it succeed while others stagnate. The four included battlefields are all interesting and beautifully drawn. The three levels of difficulty help ease newcomers into the action while keeping things challenging for Trenches veterans. And the simple control scheme (use two fingers to control all of your troops at once, for example) makes playing easy and intuitive. Because of all these factors, Stenches is a cut above the flood of “me-too” games flooding the App Store. Bottom Line: Stenches: A Zombie Tale of Trenches may be yet another tower-defense game. But wonderful production and great game design make this one a cut above the rest. Stenches is compatible with iPhone, iPod touch, and iPad. Requires iOS 3.0 or later.